Male Face Shapes: What Kind of Beard Should You Grow? One thing I’ve felt always gets ignored when people try to figure out what their facial hair should look like is the shape of their face. Like it or not, we don’t all look like Brad Pitt – and so much the better, since there are handsome faces of all shapes and sizes. Still, it can be tough to figure out the best possible facial hair style to put on your face to accentuate the best parts of you. That being said, we’ve decided to throw together a quick guide to male face shapes, so that you can figure out what you should turn your beard or moustache into to make sure you’re matching the way you really look. There’s nothing worse than a mismatched hairstyle to someone’s face; it makes them look a bit weird, like a space alien or something. Like someone played Mr. Potato Head with someone’s features as a prank, and the guy hasn’t realized yet. Luckily, with this handy guide we should be able to figure this out for you no problem! First, we’ll start with the rounder-faced people among us. This doesn’t even have to be a weight thing; plenty of skinny guys have rounder faces or oval features, where there are few sharp edges. Luckily, with the right facial hair style, these male face shapes can be accentuated just right. Oval face shapes are pretty desirable, and pretty much any hairstyle will work with them. Still, people who have oval shapes should focus on goatees, scruffy facial hair or a fairly well-trimmed moustache. This helps the ovular shapes sharpen up a bit, and introduces some lines into your facial structure. In the case of rounder faces, the goal is to keep that rounder shape accentuated, or alternatively find ways to lengthen the face. When it comes to your hair, that might mean cutting the sides a bit closer, or pulling the hair up to make the face look longer. In the case of beards, you want to either have a neat mustache (like the oval guys), or grow out a beard and keep it neatly trimmed. The cropped beard will make the face look slimmer and more oval, so you’ll have a better chance of tightening up the face as needed. Guys with triangular male face shapes are odd ducks – their foreheads are wide, but their chins are narrow (despite their jawline being pretty broad). The pointy chin is the primary point of focus when picking the right beard for these guys, so make sure to grow out the beard as much as possible. It’s all right to keep these scruffy, if need be, as it will distract from the smaller chin and fill out the face a bit more. 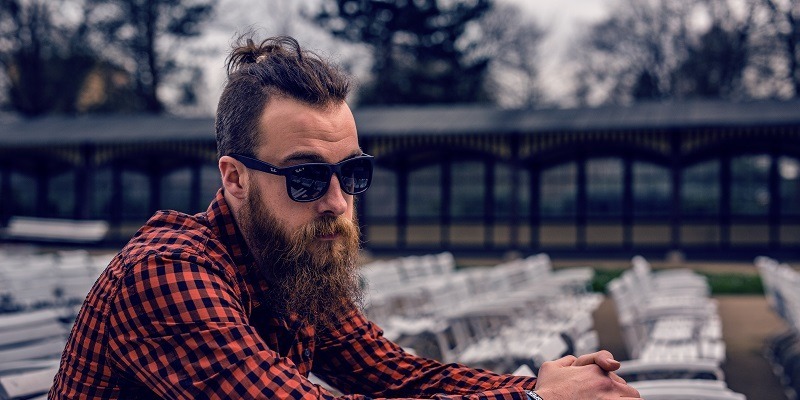 Square-jawed guys have it pretty easy – they’ve got the most flexibility of all the beard styles. The objective is to keep the square jaw, so any facial hair you do is meant to focus on that particular feature. Goatees and moustaches are obviously perfect, as they obscure as little of the jaw as possible. However, you can also keep your chin scruffy as long as it is cleanly trimmed, or grow out a bigger beard as long as you keep the lines clean. You want to stay sharp to keep that chin in focus. Pear is a bit like the triangular male face shape, but turned upside down – this time, the hairline is narrow and the jawline is broad. Here, then, the idea is to get that jawline as slimmed up as possible to match the shallower head. Guys with pear-shaped heads are good with growing out a full beard, but you have to trim it appropriately to keep the face square and maintain as much of the sharper edges as possible. This will allow the face to be more balanced, especially if it is paired with a rounder haircut to grow out as much of the hair as they can. In the case of rectangular faces, these guys need to make sure their faces are as shortened as possible – they’ve got that strange case of horse-face, so anything to square things up is a treat. A moustache or full beard is perfectly fine, but they need to focus on being neatly cropped and shaped to square up and shorten one’s face. Height must be de-emphasized with rectangular faces, so be sure to keep that in mind when growing out facial hair. Last but not least, there’s the problem of the diamond male face shape – these guys have a more rounded hairline, narrow chin but big ol’ cheekbones to center focus on the middle of the face. In these cases, it’s important to square up the face as much as possible. Wearing bangs is a plus for these guys, but on the facial hair front they want to have a full beard as well. Don’t even worry about trimming it too much – you want as much volume as possible to keep the face squared off. While this sounds like we’re hiding you in hair like Cousin It from The Addams Family, it just manages to hide the worse features and keeps your face nice and symmetrical.